Within the realm of consumer electronics, size most definitely matters. Designers of electronic products – from smartphones to flat screen televisions to the latest video game consoles – are tasked with dramatically increasing the level of functionality of these devices while keeping them small and compact. For manufacturers, the challenge is to ensure the huge volumes of electronic devices made are subject to a high level of scrutiny on the production line, so that every single one has been produced to the same exacting standards. To do otherwise would risk consumers losing faith in a brand that is undoubtedly already under fierce competition within a saturated marketplace. 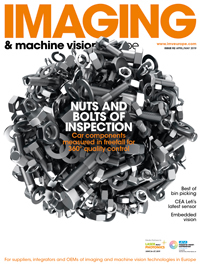 Manufacturers are therefore turning to the latest machine vision inspection systems. According to Johannes Hiltner, product manager for Halcon at MVTec Software, matching and positioning are the standard and therefore most important machine vision tools used in the electronics arena. These are used, for example, for board alignment or fiducial localisation, both of which are the most basic processing steps within electronic device production. He added that multi-camera setups are enabling high-precision 3D image processing, which is not only the natural progression from 2D technologies, but offers many additional advantages. For example, 3D technologies enable not only presence checks but also volume measurement, which comes in handy for high-precision solder paste inspection. When it comes to board inspection and wafer inspection, MVTec’s Halcon and Merlic software solutions recognise defects with an accuracy greater than 1µm. From insufficient soldering paste to missing diodes and rotated components, the software detects all incomplete or incorrectly positioned parts within milliseconds. Moreover, it can find objects with an accuracy better than 1/20 pixel if they are partially occluded. ‘Component identification technologies, like barcodes, data codes and text recognition, should also be mentioned here,’ said Hiltner. ‘With this technology, manufacturers can ensure that the correct parts are being placed and assembled. Thus, each component can be traced through the whole production process. 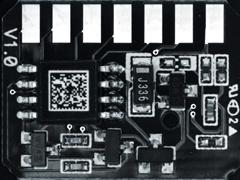 Advances such as high-resolution cameras, advanced computation technology and highly sophisticated algorithms enable high-speed processing, accuracy and robustness.’ Another important technology in the inspection process highlighted by Hiltner is sub-pixel accurate high-precision 2D measuring, which is used for presence checks of electronic components. In terms of the technology being deployed, Edmund Optics’ Hollows noted that 3D metrology, spectroscopy, and hyperspectral imaging are all becoming part of electronics inspection. The two key elements that are making this possible are the growth of lower cost, more efficient sensors and lighting technologies. Furthermore, more powerful optical design software is allowing for advanced optical designs to meet needs associated with developments in sensor technology. There are also improvements being made in optical fabrication and metrology equipment for producing these designs. Lenses play a critical role in electronics inspection, and the latest Techspec telecentric lenses from Edmund Optics are well suited to both single unit inspection stations and high volume implementations. The company has recently launched six new models with longer working distances of 220mm and 300mm into its Techspec compact range of telecentric lenses. These latest releases bring the model count within the range to 40, with magnifications varying from 0.5x to 8x and working distances from 40mm to 300mm. All sizes and working distances are available in models with an in-line illumination option, and are designed with a port to connect a fibre optic light guide or LED module. The fixed aperture and lockable focus of these lenses make them ideal for implementation on assembly lines as they remain permanently fixed. ‘In general, production processes are getting faster, and with technologies like 3D scene flow, robots and humans are working together hand-in-hand in order to realise a true Industry 4.0 environment and work atmosphere,’ continued Hiltner. Industry 4.0 stands for the fourth industrial revolution, which largely revolves around digital production and factory processes interconnected and automated via the internet. Electronics manufacturers like Siemens are leading the way in Industry 4.0 – its Amberg, Germany factory is a good example making 12 million Simatic PLCs a year. Edmund Optics’ Hollows agreed that factories have the potential to become fully automated, removing the need for the current work force to engage in dull, dreary, and sometimes dangerous work. As the level of automation rises, manufacturing costs reduce, but in order to meet demands – especially in terms of handling smaller parts and higher production speed – Hiltner said that the speed and accuracy of existing fundamental image processing technologies, like matching and measuring, need to be improved. Furthermore, the range of available technologies needs to be expanded with new efficient algorithms and methods, such as 3D measurement or 3D inspection. He added that another issue is the incredibly fast-paced development environment. Because of the competitive nature of the electronics market, some applications go from concept to deployment before true validation can be carried out. Hollows remarked that the machine vision industry needs to be willing to take the same risks as the electronics sector. ‘You have to develop new products and technologies before the volume demands really exist,’ he concluded.